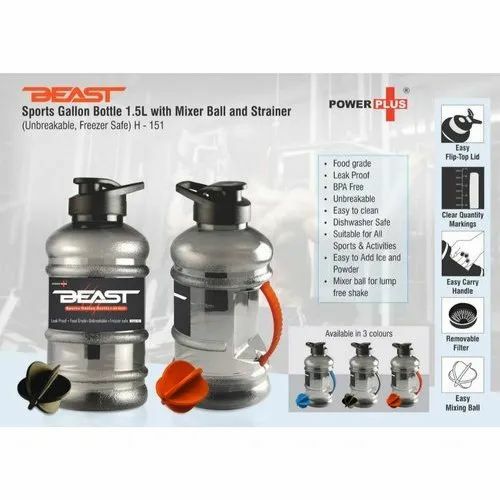 Our firm offers a varied range of Sports Gallon Bottle 1.5L With Mixer Ball And Strainer. Professionals develop this product as per worldwide industry standards. We offer this product at nominal costs. We, “Traaviyo”, are a reliable wholesaler, occupied in offering Sipper Bottle, Travel Mug, Flask Bottle, Shaker Bottle, Sports Bottle, Water Bottle to our clients. The provided products are conceptualized with client-oriented approach to bring the extreme gratification to our patrons. The offered gamut of products is rendered in provided with the quality constraints by our very capable experts who hold rich understanding in this particular field. We have chosen an adroit team of quality supervisors that value the quality of our provided products at each stage of development to make sure that the norms are effectively met. To offer extremely reliable products to the patrons, our team members use quality tested material that is taken from the reliable vendors and progressive technology in the best possible way. We direct all our activities to cater the expectations of customers by providing them excellent quality products as per their gratifications. Moreover, we follow moral business policies and crystal pure transparency in all our transactions to keep healthy relations with the customers.